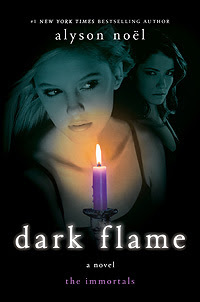 Dark Flame was written by Alyson Noel. It is book 4 in The Immortal series. All I really want to say is.... Roman, Roman Roman. Talk about just loving to hate the "villain". I hate to give anything away... so I'll just say that by the end of this book I loved Roman... and was glad Ever made me feel for him.